SOMEONE (i.e. my mother) is coming to visit later this weekend and SOMEONE is allergic to cats and SOMEONE said she wouldn’t come unless my house was clean. And SOMEONE isn’t cutting me any slack. Do you know how hard it is to clean a house that is three floors, pretty damn furry and full of distractions? Twenty minutes in and I was begging for a nap. And a maid. And a bald cat. Not to mention, and I don’t know if this is part of the nesting thing or what, but little things that have been this way since we moved in two years ago are now driving me bananas. The screws left from the previous owners in the master bedroom walls? BANANAS. A little dirt spot on the wall at the top of the stairs? BANANAS. The unused living room with only a couch? BANANAS and begging for a rug, coffee table and new chair. Messy linen closet? $%&#!#% BANANAS. It took me three times longer to clean because those little things? F6&@$%^ add up. And cause backaches. Oh man, do they cause backaches. ANYWAY. At least I don’t have pregnancy stupidity yet. Like many people do. Because, apparently, elastic waistbands are too much for some people to comprehend. 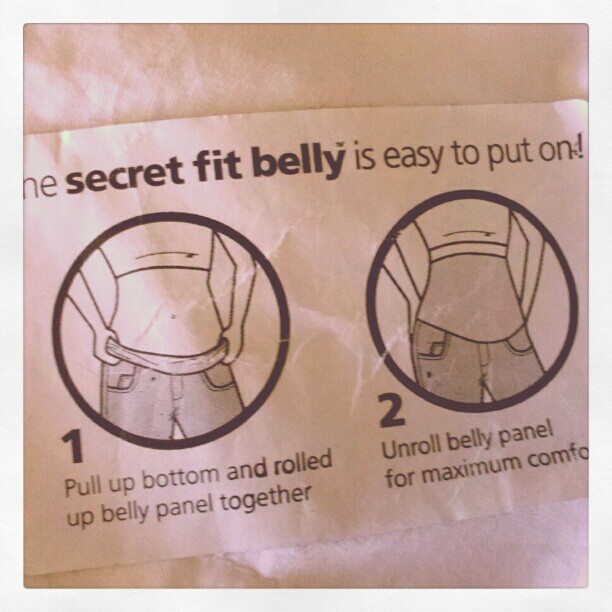 Good thing they explained how to work those pants. Someone may’ve tried to detach the panel and use it for a hairband. I’m not gonna hate. There are mornings I’ve wanted instructions for my pants, too. And don’t get me started on shirts. It’s a miracle we’ve even gotten to this stage of civilization and people aren’t just walking around half naked. To quote the epitome of TV nerds of my generation, Screech, in reference to everyone putting pants on one leg at a time: WE DO?? I have to admit there were a few maternity items that I had no idea how to put on. I had hand-me-downs from my sister and she told me how to wear a few things when she gave them to me. I laughed at the time. When I put them on I thought, “Thank God she told me. I wouldn’t have figured this out!” But those pants in your photo, those look self-explanatory. I always clean for my mom to come over then she just ends up cleaning when she gets here. It’s like that extra layer of clean that I can never achieve. Hopefully you will recover from your backache to enjoy seeing your mom scrub random spots on your walls! I actually got about 90% of the cleaning done! I just didn’t mop the main floor. But I did vacuum it, so I consider it a win. And I didn’t do any yard work. My mom’s duties this visit are to paint the nursery and landscape the yard. She is coming equipped with a suitcase full of hostas and day lilies, no joke!